The US Forest Service’s Southern Research Station released a report assessing the current and potential impact of the rapidly expanding wood pellet export market on the forests of the US South. The South is already the world’s largest manufacturer and exporter of wood pellets as fuel for electricity generation. The wood pellet industry has plans for exponential expansion over the next several years with most of the pellets exported to Europe to be burned for electricity. Over the past few years, scientists, local community leaders, river keepers and conservation organizations have sounded the alarm as dozens of new wood pellet export facilities have been constructed and/or announced. Concerns about the impacts have grown with ongoing documentation that the South’s largest wood pellet manufacturer, Enviva, is getting wood from clearcut wetland forests. This latest report should force policy makers in Europe to pause and rethink the policies that are driving, not only increased smokestack CO2 emissions in Europe, but deforestation across the pond. It should also make our own Environmental Protection Agency think twice about the impact its recently released draft rule regarding forest-based biomass is going to have on one of our most valuable natural resources – standing forests. The recent growth in wood pellet exports has in fact resulted in increased logging, and continued expansion in the industry will result in the further expansion of logging. Wow! Really? All this time the wood pellet industry has claimed that they are simply taking scraps from land that would have been harvested anyway and that they are not causing an increase in logging. I guess we can lay that fallacy to rest now that the US Forest Service has confirmed that, yes, the rapid growth in wood pellet manufacturing is in fact driving increased logging. The Southern US is lit up red with forest cover loss. 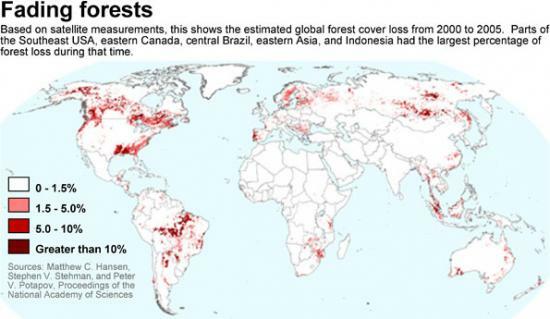 Global maps of forest cover loss released by National Academy of Science last year show the rapid rate of forest cover loss from logging in the Southern US was four times that of Brazil during the study period from 2000 to 2012. We need to reverse that trend, not accelerate it. The NASA maps and associated report emphasize the need to look beyond mere acres of forests as a measure of sustainability. 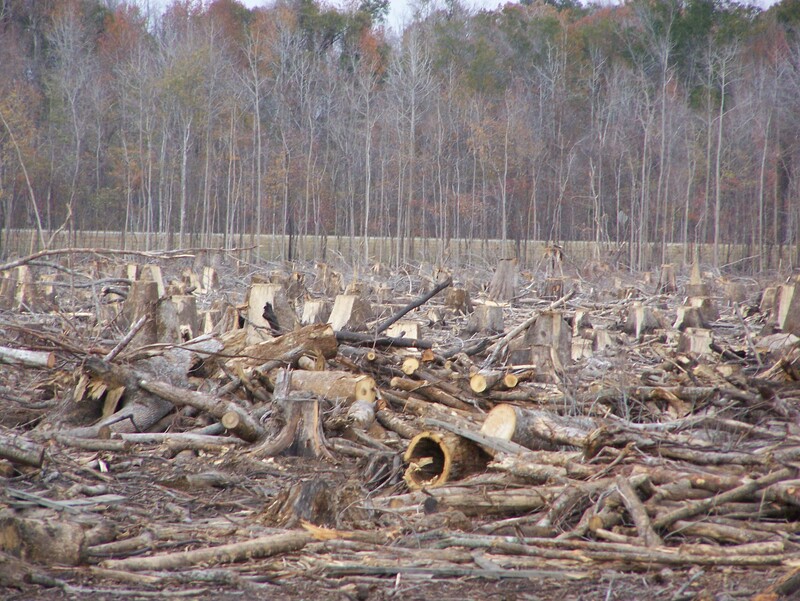 We must also pay attention to the rate and scale of forest cover loss from logging. When forests are cleared, it takes many years for them to recover, disrupting critical ecological services, including carbon storage. The growing European appetite for wood as a fuel source will result in more pine plantations across the South. The US Forest Service report finds that there could be enough wood to supply increasing demand for wood pellets, but that comes at a price – more plantations, and that means the continued conversion of natural stands to plantations requiring chemical herbicides and fertilizers. It could also mean the industrial use of genetically engineered trees. Pine plantations are a far cry from natural forests. 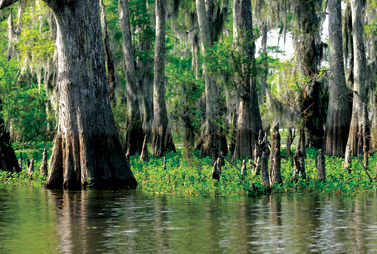 The South’s landscape has already been heavily fragmented and degraded by the establishment of fast-growing single species pine plantations, contributing not only to species loss but also to the loss of entire ecosystems, such as the long-leaf pine ecosystem, and to the disruption of entire watersheds, such as the Waccamaw River Basin. The report also points to the establishment of plantations on “marginal agricultural lands”. This too has important implications for the future as the loss of agricultural lands could drive up food prices, threatening food security. Whether it’s the expansion of tree plantations in Indonesian rainforests for palm oil or the expansion of pine plantations in the diverse temperate forests of the US South for wood pellets, this form of deforestation is no longer acceptable in the 21st Century. We must get beyond measuring “sustainability” simply by assessing whether we will be able to grow enough trees fast enough to supply an ever-increasing demand. That definition of “sustainability” is so last century. The report is also crystal clear in regards to what it does not analyze, and those gaps are worth noting. The report does not address the greenhouse gas implications of the growth of wood pellet exports to Europe and their effects on Southern Forests. The report does not assess the ecological impacts associated with the projected change in forest cover. The model used to predict the growth in forests and plantations was developed with data collected prior to 1997, and the authors of this report note that there are no studies using post-1997 data to support these conclusions. It’s time to move into the 21st Century and recognize that forests are so much more than the fastest growing trees or the wood they contain! They are homes to countless species of plants and animals. They protect us from storm surges. They remove carbon from the atmosphere. They generate and purify our drinking water. They make life on Earth so much more enjoyable! Forests are complex living ecosystems that are essential to our long-term survival. So next time the wood pellet industry touts that they are protecting forests by creating a market that ensures landowners are growing trees, think about what that really means. Think carefully about whether accelerated logging and the further expansion of pine plantations is the direction we need to be going in to sustain life on Earth. Think hard about whether this is the legacy we want to leave behind for future generations. Contemplate whether this kind of “yesterday’s” thinking is going to help us solve the sustainability challenges of the 21st Century where climate change, species extinction and water shortages are becoming more evident every day. New corporate and government policies have the potential to create an economy that encourages landowners to grow forests for carbon sinks, storm protection, biodiversity and water filters. With policies in place that actually incorporate the value of these critical services, we can expand markets and investments that encourage the restoration and maintenance of large expanses of natural forest cover, bringing much needed balance back to the natural world and ensuring the health and safety of our communities. Our challenge in this decade is to fully embrace new ways of relating to the natural world, letting go of the old paradigms. This latest USFS report is an indicator that we clearly aren’t quite there yet. We still have some serious work to do. Let’s hope those with decision-making authority finally start seeing the forest for the trees. I don’t see tongass old growth forests in Alaska on NAS map. Lots of big old effing trees. .